There are a number of game franchises I've just simply never been able to appreciate - Metroid, Advance Wars, Metal Gear and Castlevania all come to mind. While I still haven't been able to force my way through any of the numerous incarnations of the first three game series' mentioned, it wasn't until last years Dawn of Sorrow that I finally saw what all the huff was about with the Castlevania series, despite already owning both Super Castlevania IV for the SNES, and even Circle of the Moon for the GBA. Could it have been just a fluke that I actually enjoyed a Castlevania game? Well I've put that theory to rest, because after successfully completing Portrait of Ruin I have now realized this is a fantastic game series (in 2D form anyway) and have now found my new favorite DS title. One of Portrait of Ruin's big improvements over past titles is the introduction of a new dual character mode, obviously introduced to help keep the series fresh. Throughout the entirety of the game you'll be able to switch off playing as either the whip wielding hero Jonathon, or as the spell casting heroine Charlotte. 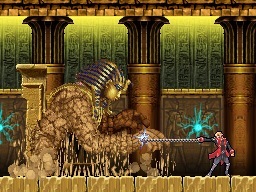 While Jonathon is able to choose from a much larger selection of primary weapons, such as giant axes, knives and the infamous whip, Charlotte is stuck with basically the same attack throughout the entire game. However being a witch, she is the only one to wield the power of magic, and her secondary attacks are what make her somewhat of a use over Jonathon. But in the end, I rarely found myself ever actually using Charlotte at all. Her power is laughable when compared to Jonathon's, even with some of the most advanced equipment. It seems like this was somewhat of a missed opportunity. Had the character balance been a bit more equal, utilizing and mastering each character would have been an added challenge and made the co-op game style a lot more fun. If you choose to, you can also have both characters, on the field at the same time. You control one, and the CPU controls the other. This is a useful tactic at times when you find yourself surrounded by a cloud of enemies, and especially when you want to dish out serious damage to a boss. Yet from the get-go you'll notice the computer intelligence really isn't all there. With a more offensive approach, your partner can certainly help deal damage but it also takes in a lot of damage as well. Luckily the blow is lightened slightly in that when your partner is attacked your magic bar is what is depleted - not your health. While the game certainly adds new elements to the series, it also builds upon the existing foundation. The magic system is much more improved over what we saw in Dawn of Sorrow. By adding a second character it also opens up the ability to use even more attacks instantly, including very powerful "dual attacks." Sticking with the RPG-like level up system, your characters will become more powerful as you progress through the castle and be able to obtain new weapon upgrades and defensive garments. The graphics have been upgraded a bit as well, with more 3D effects, especially in the backdrop; all in all 2D gaming has never looked so fine. The castle itself this time around is gigantic. 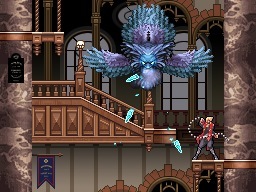 The main area is almost equivalent to Dawn of Sorrow in size, and like the games name suggests, you'll come across giant portraits that open a gateway to a whole new area that is separate from the castle. There are a total of eight portraits in all, and each is fairly large in size. Like past Castlevania's, the game also tracks how much area you've explored, and the considerable size of the game makes this one hell of a task. After completing the game I had traversed through roughly 85% of the entire game, and looking at the maps I was unable to find any areas that I had missed, meaning about 15% of it all is hidden away, waiting to be discovered. So with all of this praise what exactly does Portrait of Ruin do wrong? Not much. I mentioned earlier about your partners AI, but beyond that I'd say my only gripe is the length of the game. After only seven hours of game time I had completed the final boss at a percent ratio of 85%. Luckily Konami made sure to add in a number of side quests, the most robust of these is found from one of the characters within the castle named Wind (he has a different identity later however), who offers around twenty missions for you to accomplish. With only the help of a tricky clue you have to scale the walls of the entire dungeon in order to figure out the riddle, and often times I found myself downright puzzled on what to do. The addition of online play, whether it be the co-op mode or set up shop mode, is also a nice addition, and will certainly help keep this one in your DS for some time to come. I'm simply astonished at the fact that Konami has created two of my favorite DS games in only a year apart from each other. Castlevania veterans might grow a little tired of the same old gameplay in a new setting, but there's no denying Portrait of Ruin replicates everything that has made the series so great. For those of you who were like me and are a little weary of embracing the Castlevania name, don't be. This is truly action platforming at its finest form and deserves every gamer's attention. One of, if not the greatest DS title has arrived folks, and just in time for the holidays, so enjoy it. What's Hot: Incredible gameplay, deep customization, and some nifty online options to boot. What's Not: Somewhat impaired computer ally, and a little too short.